Size - The ideal male stands 19½ inches at the shoulder and the ideal female is 17½ inches. The acceptable range for males is 18 to 21 inches and for females is 16 to 19 inches. Type and soundness are far more important than size. Proportion - The length of the body is slightly greater than the height at the withers, in a ratio of approximately 11:10. Care should be taken not to interpret a heavily coated dog as being too short of leg. In addition, a dog which carries itself in a more upright manner will give the impression of being closer to square than it is in actual fact. Substance - The breed has a greater substance than might be expected for its size: bone is substantial and muscles are well developed. The general appearance of the head conveys strength, yet the expression is soft. The skull is approximately as broad as it is long. The top of the skull is slightly domed. Depth of skull is equal to breadth. The stop is well defined, with an easily distinguishable frontal furrow. 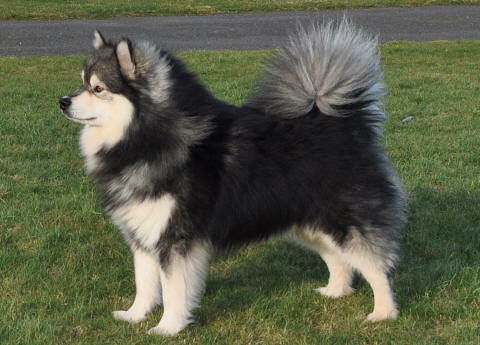 The ears are set rather far apart, just off the top of the head and should be small to medium in size, triangular in shape, broad at the base and rounded at the tip, and covered with a heavy coat of hair. Ears may be erect or semi-erect (tipped). Drop ears are a fault. Eyes are oval in shape and as dark as possible. The color of the eyes may blend with the color of the coat, being lighter in lighter colored dogs. Yellow or blue eyes are a serious fault. The muzzle is strong, broad and straight. When viewed from above or in profile, it tapers slightly but evenly. The length of the muzzle, from tip of nose to stop, is slightly less than the length of the skull, from stop to occiput. Pigmentation of the nose leather, the eye rims, and the lips are preferably black. However, brown dogs will have dark brown pigmentation. The jaw is strong, the lips tight, and the bite is scissors. A bite that is overshot or undershot is a serious fault. The neck is medium in length, strong and well muscled. The back is broad, strong and straight. The loin is short and muscular. The croup is of medium length, well developed and only slightly sloping. Overall, the topline is level. The depth of chest is slightly less than half the height of the dog, reaching almost to the elbows. The ribcage is rather long and not very broad. The ribs are slightly arched, with a clearly visible, but not strongly defined, forechest, never barrel-chested. The underline includes only a slight tuck up, more pronounced in males than females. The tail is set on rather high and is covered with a profuse coat. When moving, the tail is carried over the back or side. When at rest, it is often dropped, particularly in females. A mobile tail is desirable. The tail may have a "J" hook in the end, but should not be kinked. A kinked tail results from the fusion of vertebrae and cannot be straightened out completely. A kinked tail is a serious fault. The front legs give the appearance of being strong and powerful, with heavy bone emphasized by thick coat. When standing, the front legs are straight and parallel when viewed from the front. The shoulder is moderately laid back. The upper arm is equal in length to the shoulder blade, and the angle formed by the two bones is slightly greater than 90 degrees. The elbow is just below the bottom of the rib cage and points straight backwards. The pasterns are of medium length, flexible and slope slightly when standing. Front dewclaws are normally present and should not be faulted, but may be removed. If present, they are set on very close to the leg and are barely visible under the coat. Feet are well arched, oval rather than round, with toes slightly spread, to act as a snowshoe. Pads are thick and elastic. Pigment in the pads and nails is generally dark, but may blend with the color of the coat. The feet are covered with a thick coat of hair, including between the pads. The rear legs are strong and powerful, appearing straight and parallel when the standing dog is viewed from behind. From the side, the angulation is clearly marked but not extreme, and in balance with forequarters. The upper thigh is of medium length, rather broad, with well developed muscles. The stifle is well angulated. The second thigh is at least equal to the upper thigh in length, and is well developed. The hock joint is moderately low set and well defined. The metatarsus is rather short, strong and vertical. Rear dewclaws may be present, but are not desirable. Removal is acceptable. Rear feet are the same as described in Forequarters.